Highproxies Review & Rating 2019 - Why 4.8 Stars? HighProxies is one of the best private proxies provider, offering datacenter proxies which located in US, CA, UK,NL, Germany, France, and Italy. The Customer support is very responsive and fast, HP’s Private Proxies are really fast and stability, Support both user/password and IP-Auth. In recent years, there’s been an uprising of many proxy providers. But very few providers have been able to garner customer satisfaction along the way by providing top class service. Highproxies is undoubtedly one of them with their highly anonymous dedicated HTTP/HTTPS proxies that come with fast connection speed and ensure a hassle-free setup. Headquartered in a small African island country Seychelles, Highproxies has been around for over four years and in this time they have gained much recognition for their service. We have recently reviewed their proxies thoroughly and can safely say they are one of our top three most favorite proxy providers. Let’s look at some of their positive and negative issues. Fast and dedicated HTTP/HTTPS datacenter proxies. Up to 100 concurrent connections at a time. Instant delivery of proxies after payment. Diverse packages to accommodate your need for different websites. Customer support is very responsive and fast. New IP can be requested every month. Large collection of datacenters scattered across the USA and Europe that ensures high speed and low ping. Does not offer SOCKS proxies. Does not offer sneakers proxies. Need Proxies for sneaker websites? Visit Here to find out. One of the best things about Highproxies is that they offer a variety of proxy packages for the need of their customers. Whether for maintaining multiple Instagram profiles or for postings ads on Craigslist or simply for bypassing restrictions, Highproxies offer a range of packages. Interested in Instagram marketing? You may be like to Read: Is proxies essential for Instagram automation tool? All the specialized proxies are dedicated and private proxies so there’s no risk of getting banned due to the behavior of other users. They also offer shared proxies that come at a much cheaper price tag. But shared proxies come with some negative sides too, such as being shared across multiple users and limited server locations (only Buffalo, Chicago, Los Angeles, New York, Seattle and Dallas servers are available for shared proxies). 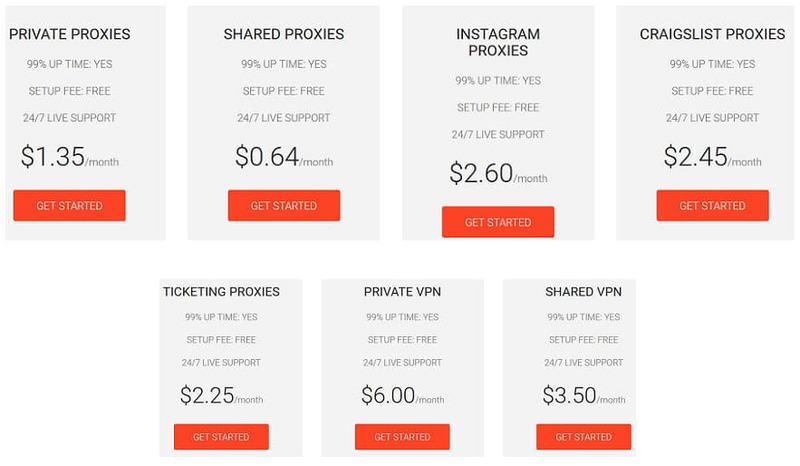 The shared proxies start as low as $10.90 per month for 10 IPs. 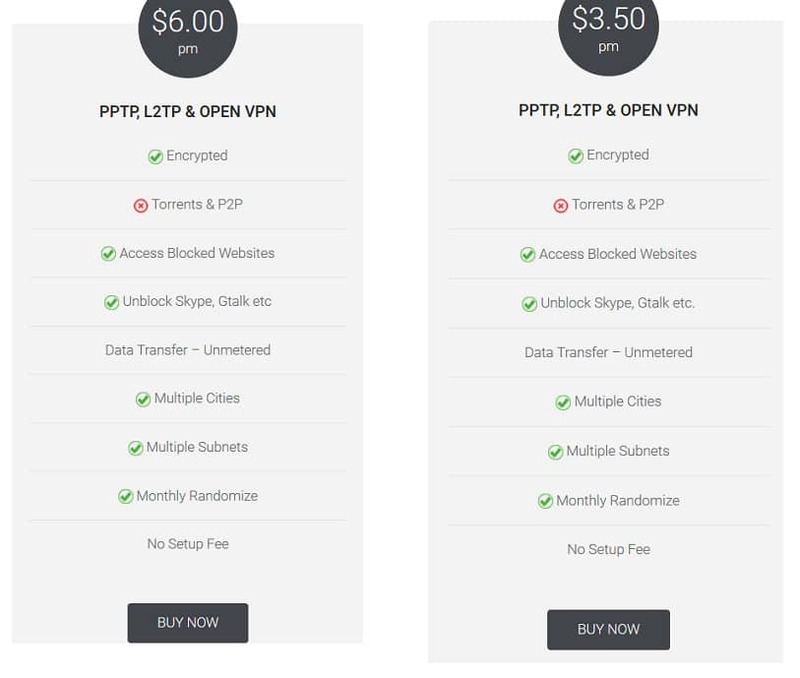 You can also buy a single private proxy IP for only USD 2.30 per month. You have the option to buy upwards of 1000 private proxies for USD 1400 per month or up to 2000 shared proxies for USD 1280 per month. Can not afford? I suggest you use Instant Proxies. Highproxies also offer custom packages according to the customers’ needs which can be availed by issuing a support ticket. The specialized proxies are a bit expensive as they come with added features such as Monthly Randomized IPs, Multiple subnets etc. Although the proxies are priced at a decent tag, Highproxies do not offer test proxies. However, the user has 3 days to claim for a full refund after their purchase. All packages offered by Highproxies can be found below. A very positive thing about Highproxies is, they let the users know about their proxy server locations by marking them on a digital map on their website. This is open and visible to the public so that a potential customer can understand whether there is a proxy server nearby and if it would serve the user well. With over 50000 proxy IPs in over 50 servers at 30 locations and 7 countries, Highproxies has a diverse collection of proxy servers scattered across the USA and Europe to meet the demand of the customers. Apart from the USA, Highproxies has servers in Canada, the Netherlands, United Kingdom, Germany, France, and Italy. Highproxies also boasts the specifications of their highly configured and up-to-date hardware and software configuration to ensure 99% uptime with high anonymity. 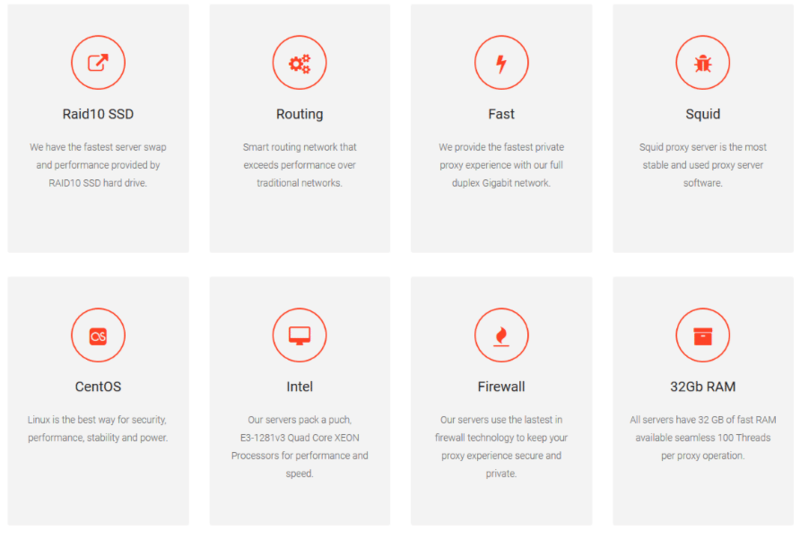 They also have very high-speed connections and Squid software so that the network does not create any bottleneck issues. The customers can ask for specific locations during registration as well. Another interesting aspect of Highproxies is that they also have a dedicated page on their website that shows the status of their servers in real time. This is very useful for the users to check whether the IP he/she’s using got banned or if the server is actually down. However, during the test period, we encountered no such issue of their servers being down and which once again proved their great service. To carry out an unbiased review, we purchased dedicated Private Proxies from Highproxies. By using whoer.net, we then performed tests on the proxy IPs provided by Highproxies to determine the network ping in different locations. All of the IPs were had pretty good ping time especially in Georgia, USA although the IPs were generated from all across the USA. The ping duration is very important while considering proxy IPs. And Highproxies has definitely impressed us with their very good ping. Since all of the proxy IPs we tested were of the USA, the intercontinental ping duration was bound to be longer. Still, the ping to the servers from the UK was still relatively acceptable. Highproxies lets users choose proxy server locations from either the USA or Europe. For review purpose, we chose the USA proxy servers and performed geolocation tests. While providing the IPs, Highproxies also lets the user know where the server is located. 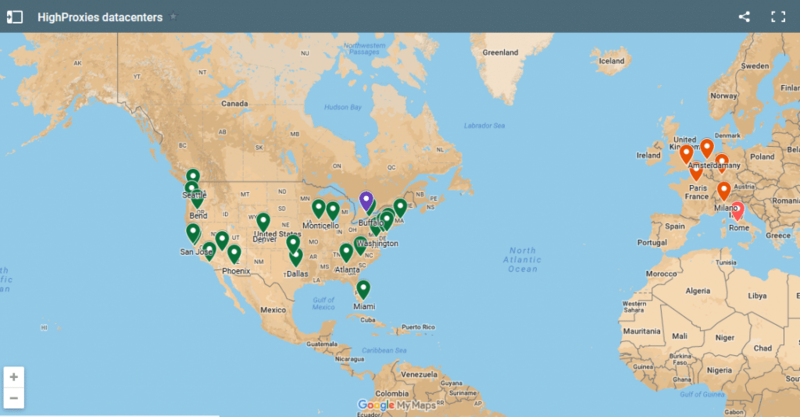 By performing the tests, we verified whether the locations are actually what another website sees and sure enough, they are! Here is ours IPs test, you can check ISP of Highproxies’ Proxy servers. 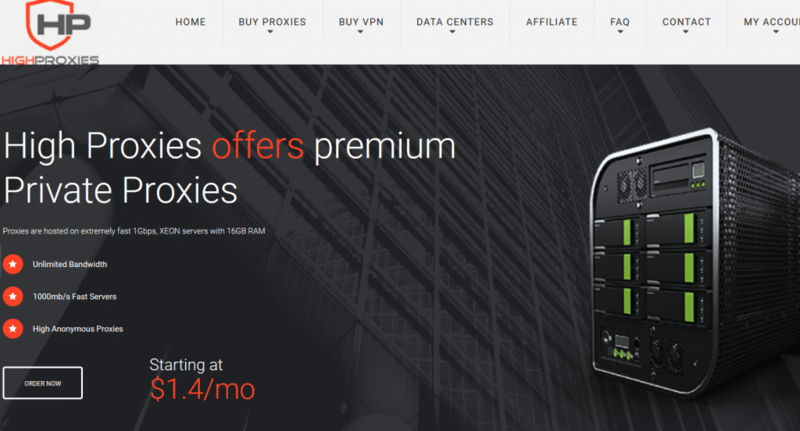 Although Highproxies does not offer new proxy IPs every month by default, they provide new proxies should you need them. But the downside is, the proxies can be renewed only once per month. Ticketmaster proxies offered by Highproxies do not support randomized proxies. All packages of Highproxies come with unlimited bandwidth facility. But as the shared proxies are shared across multiple users, they do not guarantee very high-speed connections and warns about the possibility of getting banned due to other miscreant users. Highproxies guarantees 99% uptime of their servers and shows their server status in real time. During our test period, we also found this to be true. After completion of payment, the proxy IPs are distributed automatically. So you don’t have to wait after the registration process is complete and can apply the proxy IPs instantly using the given username and password. Highproxies has a 3-days money back policy. Due to their lack of a trial period before buying proxies, customers often hesitate before investing. The 3-days money back policy will come in hand to many customers to determine if the proxies are suitable for their need. One of the most important things in any business is customer retention. It is often the case that the customer does not get proper support after buying the service. Highproxies ensures this is not the case with them with 24/7 available customer support center. They are very cooperative and replies fast too. Highproxies offers specific packages of proxies to be used in specific websites such as Instagram or Craigslist. Since many websites require virgin proxy IPs that were not used for any other accounts previously, Highproxies carefully distributes their proxies across the customers. These proxies let customers browse those websites with peace of mind. However, Highproxies does not offer sneakers proxies which are of very high demand lately. Highproxies has a very intuitive and easy registration process. The landing page of their website has the packages offered by Highproxies from which the users can directly go to the buying page. The users can also check out the detailed packages and price listings from the navigation menu. 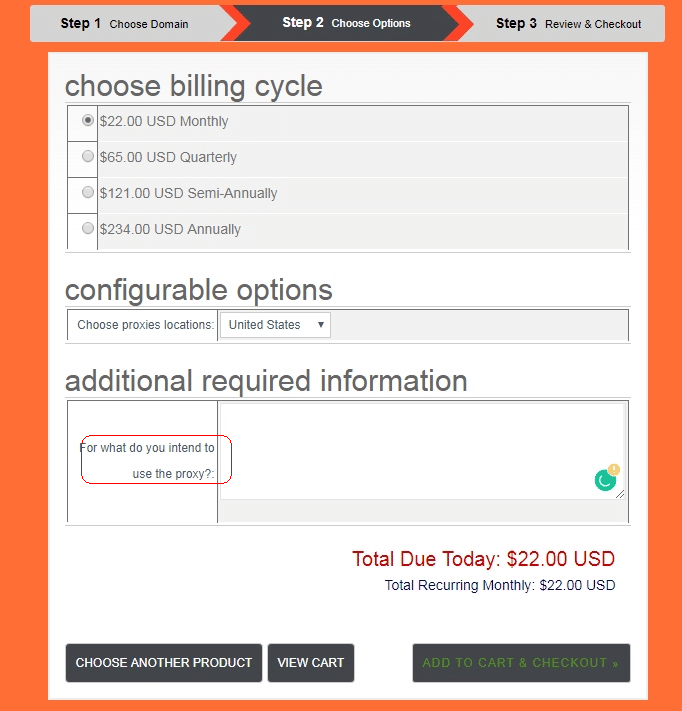 The customer can also select the server locations (the USA or Europe) during registration. The customer also has the option to add the desired usage for the proxy IPs. After completing the payment via Paypal or Payza or via Coingate, the customer is instantly presented with the desired IPs. Highproxies has some video tutorials on their website showing how to configure the browsers or applications to use their proxies properly. You can configure proxies for each application on PC individually, the process can vary from one application to another. You can usually find the option to add proxy in the settings section of an application. Sometimes this can also be under the Network settings. When you buy a package from Highproxies, you are given a username and a password. You’ll have to enter the username and password when you connect to the proxy. This process also varies from one application to another. Sometimes the username and password have to be entered alongside the proxy settings, while in other applications, mostly in browsers, there is a pop-up window asking for username and password. To use the same proxy settings across all applications, it is better to configure the system proxy settings. You can find this by searching for Network Proxy Settings in the Windows start menu. You can also use proxies in smartphones. Unfortunately, smartphone apps still cannot be configured individually for each application. Instead, you can add a system proxy from the settings. To add a proxy on Android or iOS devices, go to WiFi or WLAN from Settings app and then click on the connected WiFi. You can add the proxy IP and Port address by scrolling down from there. As Highproxies offer username and password based authentication, a broswer pop-up will appear when you save the settings and start using the internet with the proxy. When we first started reviewing the Highproxies, we immediately had a feeling they really care about their customers as they had a very attractive and informative website that is also very intuitive. They also have very positive user feedbacks in elite forums such as Blackhatworld etc. With passing time and rigorous review, we have concluded that Highproxies is undoubtedly one of the best dedicated proxy services. When you invest in something, you want to gain something in return. For the case of Highproxies, you get top of the class service and absolute satisfaction. While they have some areas to improve such as auto randomization, diverse server locations etc. They already have established themselves as one of the topmost proxy services. Highproxies is ranked at #3 in our expert review, and we hope it will soon reach number one position. I would recommend you use the Highproxies also, though I just buy 1 IG proxy for the instazood.com, I use HP for nearly one years, no any iusses! The Proxy get almost 100% uptime.